Beauty is power. This thought comforted Medusa--the youngest and loveliest of three beautiful Gorgon sisters, born to a sea goddess--because she alone of the sisters was mortal. It comforted her, that is, until the day masked assailants invaded the Gorgon realm and tore the two immortal sisters from their home, unmoved by their beauty or by their tears. 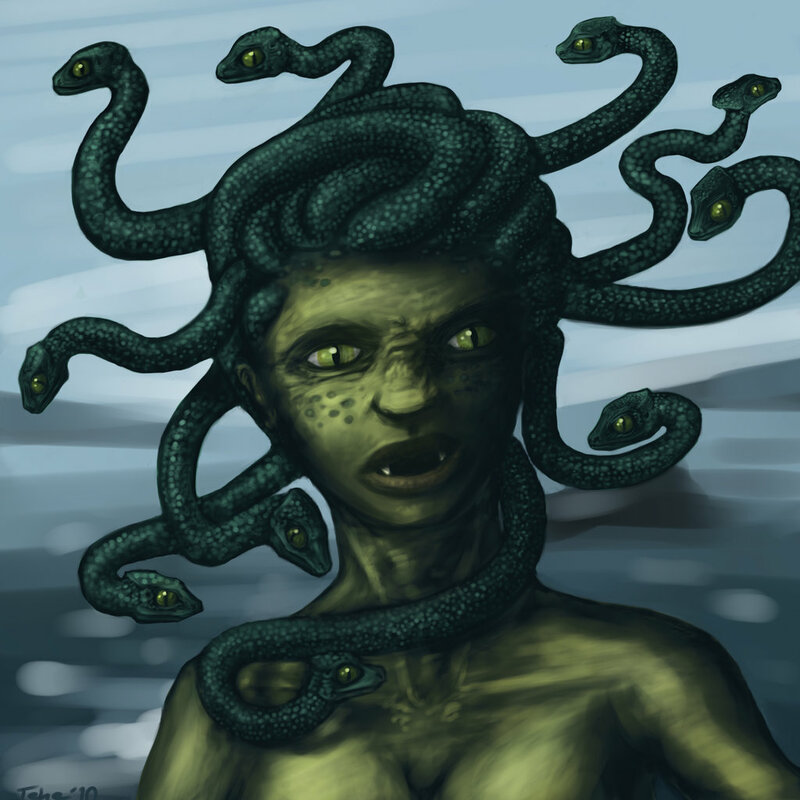 One of the invaders seized Medusa as well, but then cast her aside with a disgusted look: 'This one has the mortal stink upon her. We have no use for that which dies.' 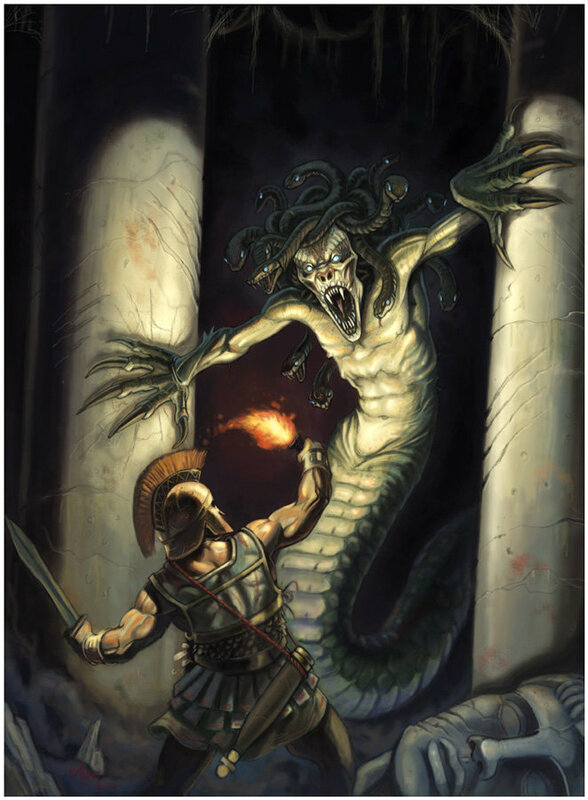 Humiliated, enraged, Medusa fled to the temple of her mother and cast herself before the goddess, crying, 'You denied me eternal life--therefore I beg you, give me power! Power, so I can dedicate what life I have to rescuing my sisters and avenging this injustice!' 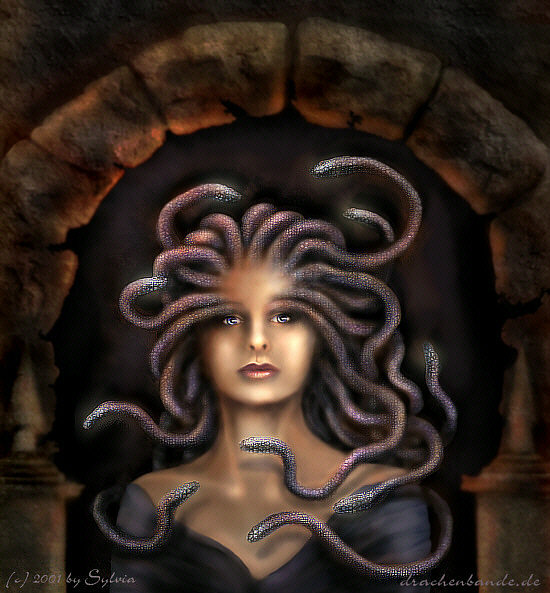 After long thought, the goddess granted her daughter's request, allowing Medusa to trade her legendary beauty for a face and form of terrifying strength. Never for a moment has Medusa regretted her choice. She understands that power is the only beauty worth possessing--for only power can change the world. Medusa is an agility hero that have a trademark imbalanced farming, carrying and also equipped with a good defense. He have a split arrow, a splashed attacks that just few of carry-ranged hero that have it. The splashed attacks is a perfect tools for farming on mid-late game where fast-farming is the key of successful game. If you can succeed in farming, Divine Rapier is one of the possibilities that will carry you into victory. 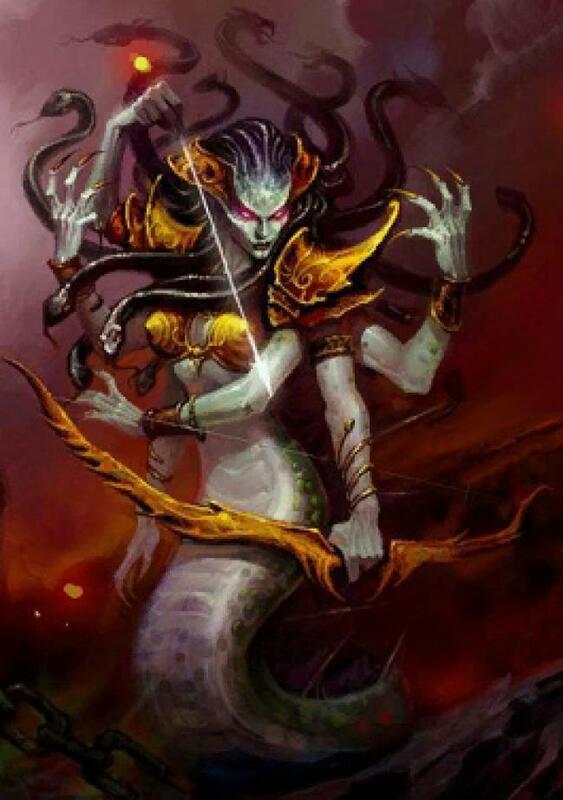 Medusa magically splits her shot into five arrows. These arrows deal a lower percent of her normal damage. The extra targets will not receive other attack effects (such as critical strike) and Unique Attack Modifiers. There is just a few ranged heroes that can split their attack. And this skill makes you special, a ranged carry with a splashed attack to deal damage to all foes. The slogan is: Just right click a target, and enemies are all gone. A mystic snake made of energy jumps from target to target dealing damage and stealing some mana. After it reaches its last target, it jumps back to Medusa to replenish it with mana. The snake deals more damage and steals more mana per jump. This is a powerful nuke for late game. This skill will bouncing from one enemy to the other. And for each bounce, the damage and mana steal is increasing. This skill makes you do skill and almost no mana loss because you get your mana back from the bouncing of this skill. Deal lots of damage to the last bounced target. So the advice is: Cast this on creeps and wait until it bounce to your real target: the enemy hero. Believe me, it will be so painful for them. Mana tips for spamming a skill: If you see your mana is full, use this skill, and it will reduce your mana because using this skill. Then wait until your mana is full again and cast this again. So this will maintain the time for constant harassing for your enemy. Creates a shield that absorbs 50% of the incoming damage by using Medusa's mana. This is your shield. A shield that made from mana. If you have lots of mana, your defense will increase. And if you have no mana, this skill doesn’t work. On late game teamfight, this skill will become very useful to block your enemy’s damage. On late game, you already have a decent mana and mana regen to block enemy’s damage that comes to you. Maintain your mana efficiently and keep up your defense by not using all your mana for spamming Mystic Snake. 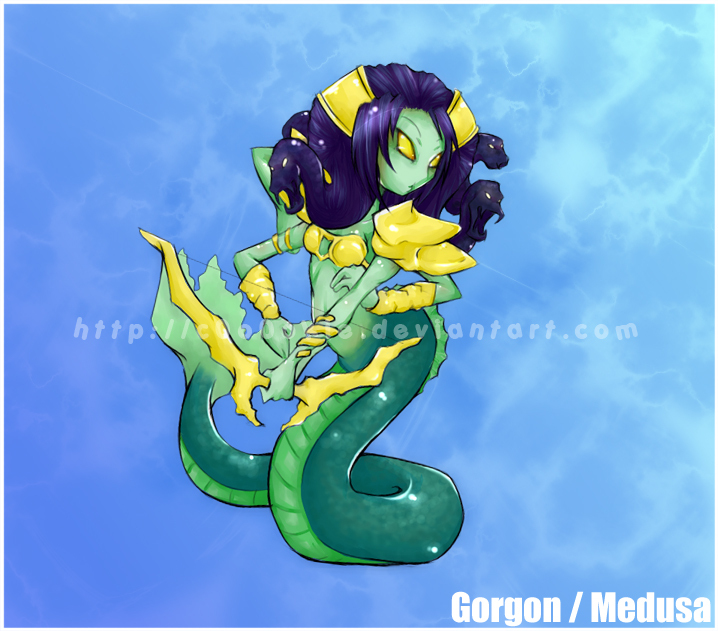 Any enemy units staring at the Gorgon will slowly turn to stone, removing status buffs and slowing all speed properties. Deals damage to summoned units and illusions. Makes all enemy in front of you to become slowed and harldy move. The real enemy will not receive any damage, but his illusions or underlings will. A nice skill to slow down enemy in a teamfight. Your enemy will lose their movement speed and attack speed, makes their carry become useless. This will benefits your team by a lot. Why take Mana Shield for level 1? You need this for the anticipation if your enemy try to get firstblood from you. Defend yourself! Why maxed Mystic Snake first? This is your main nuke for harassing and farming on early-mid game. Max this first for more painfu harassing. Why maxed Split Shot before Mana Shield? Well you need farms to become strong. Be sure to farm like crazy. Use all your time to farm as much as you can. Your target is full item with Divine Rapier equipped. On early game, on level 1 we recommend you to take Mana Shield for anticipation if enemy wants to kill you and steal firstblood. So you have more power to defense. 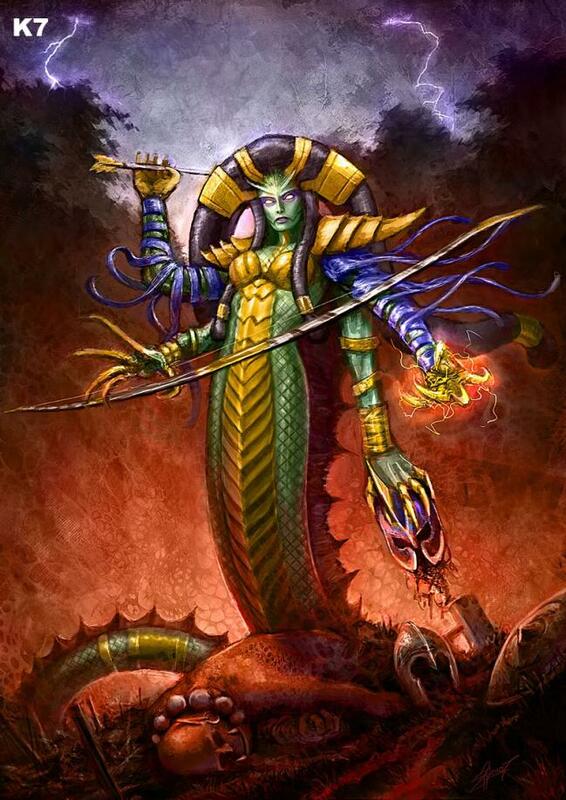 Mystic Snake is your main source of damage for harassing your enemy. This is a painful skill on early game. On level 5 and Mystic Snake level 3 you already have enough Mystic Snake damage to deal about 35% of enemy’s HP. To deal that maximum damage: You need to target creep, not hero. This way your Mystic Snake will bouncing and finally damaging your real target, enemy hero. Last hits carefully one creep by one creep. And harass enemy if they are on your range. But keep your focus on last hitting, because your priority is to gain as much gold for the late game. The slogan for mid game is just one: Farming until the like crazy. Split shot has already gain it’s damage here. So you can begin to use it for farming. Mystic Snake + Split Shot = Instant 1 wave of reeps farm. Remember to always activate Mana Shield for the anticipation if enemy want to surprise gank you. If you are being ganked, keep calm and activate Stone Gaze with the position of your body facing the enemy. With that, your enemy will be slowed and you can run away. Keep changing lane into where the enemy creeps are pushing. Keep farm there using your Split Shot and gain as much gold as you can. Remember that in late game, your team will depend on you to deal the damages in the teamfight.. If you are accidentaly participate in a teamfight, use your Stone Gaze and Mystic Snake, and after that just right click your enemy. If your Split shot is already on level 4 and your enemy is more than 1, then you must use the Split Shot to deal damage to all enemies. 3. Always use mana shield. If someone ganking you, you have the defense. And if needed, cast Stone Gaze to escape. 4. Always activate Split Shot, this is a very useful skill for farming and for teamfights. 5. Use Stone Gaze while teamfight . This will slow down their attack speed and movement speed. As a Medusa, you shoudl not afraid to buy Divine Rapier if you already have some nice items. Like if you already have Pt, Linken, Manta Style, and Butterfly. Why afraid, you have a high defense and a split shot! Passive: Aquila Aura - Grants mana regeneration and armor in a 900 AoE. Active: Toggle whether the aura affects other non-hero units. Multiple instances of Aquila Aura do not stack. Why Ring of Aquila? It gives you mana regen. You need mana regen to use your skill on early game. This items also gives some damage. Also, mana is needed to activate your shield to increase your defense. Active: Switch Attribute - Changes selected attribute between Strength, Agility and Intelligence. Why Power Threads? It will gives you attack speed, thats what you need, attack speed and damages. Power threads is laso a flexible shoes, you can change it to STR, AGI, or INT for what you need. STR for survivability, AGI for damage and attack speed, INT for mana. Passive: Spellblock - Blocks most targeted spells once every 20 seconds. -Linkens Sphere becomes more powerful the more late the game because teamfights becomes longer and you can block 2 spells in a teamfight. Active: Mirror Image - Creates 2 illusions of your hero that last 20 seconds. Melee illusions deal 33% damage and take 250% bonus damage. Ranged illusions deal 28% damage and take 300% bonus damage. Why Manta Style? Creates 2 illusion of yourself to attack the enemy and deal more damages. This items also provide a defense mechanism for you because your opponent will be confused and don't know whose to attack, they should guess where is the real you. Recipe: 2 x Blade of Alacrity + Robe of Magi + Recipe. Active: Purge - Purges a target unit, removing buffs, slowing, and dealing damage if it is a summoned unit. Passive: Feedback - Your attacks burn 20/36 mana and deal the same amount in damage. Upgradable. Diffusal Blade is a Unique Attack Modifier, and does not stack with other Unique Attack Modifiers. Remember that your illusions can deal pure damage and manaburn too. You will get tons of damages by using this because that. 6. You can increase your DPS more. Choose your own DPS items.As a carry, damage is your priority. DAEDLUS: Daedlus will provide you with the a powerful Critical Strike. MKB: 100% HITRATE will helps you to fight some evasion heroes like Mortred or Rikimaru. RAPIER: Be careful if you choose to hold this. 1 hit kill is a sure. 2-3 hits is the worst. Need protection from your support. Must come if the situation is clear safe for you to come inside the teamfight. Need disabler friends. It gives you more damage and more attack speed that makes you become much more powerful. It also gives evasion to helps you survive in teamfight. Butterfly is always a good item for an Agility Carry. Supportive heroes have disables and nice skill to helps carries and makes a teamfight easier for the team. 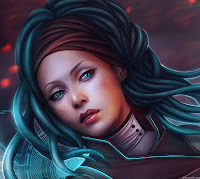 Playing with Medusa you need allies who can 4 vs 5 on a teamfight, some heroes like Invoker, Shadow Shaman, or Venomencer will do the works. Invoker have lots of AoE damages, Shadow shaman have Aoe, damages, 2 disables and Wards, and venomancer have deadly Aoe Poisons and Wards, very good for 4 vs 5 enemies. Because of your mana being burned, you have lack of mana for Reicncarnation, very annoying. Watch this game and you will know the true power of a Medusa. Watch this to know more about Medusa.